Once again the Rasa Sayang Resort & Spa's Ferringhi Grill has brought in world class dining experience for diners. 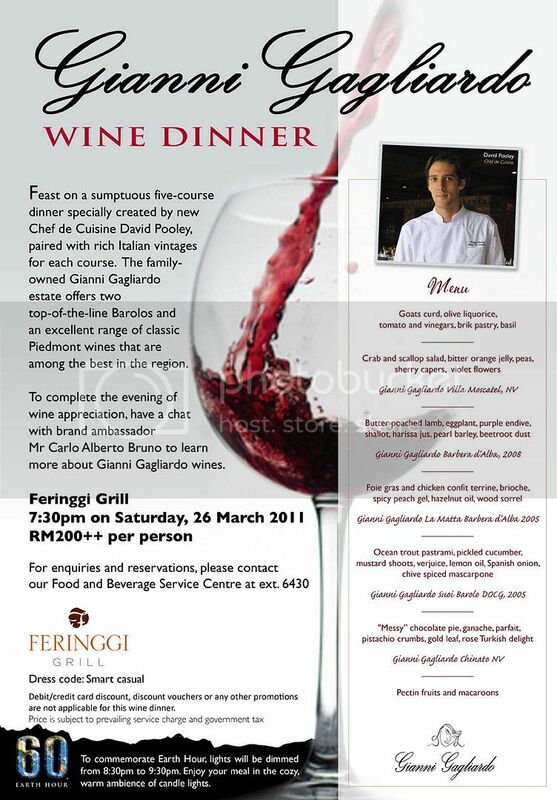 Do check out their Wine Dining promotion only on 26 March 2011, 7.30pm, at the Ferringhi Grill. Priced at RM200++ per pax, you would get to try out their newest Chef de Cuisine, David Pooley's delicious 6-course creations, paired with 5 different Italian vintages from the family-owned Gianni Gagliardo wines. Don't miss out this wonderful evening with the opportunity to chat with the brand ambassador, Mr. Carlo Alberto Bruno. I would say that I’m quite lucky to be living in this part of the world where food can be quite abundant everywhere and at any time. Other than those fancy restaurants scattered everywhere around town, you would also get those delicious street food. Those could be heavy meals, light meals or even snack of different shapes and sizes. Boy~ believe me, there are more than a few hundred variety of snacks available for grabs. Of course, my favorites would be those simple and yet fulfilling fritters. 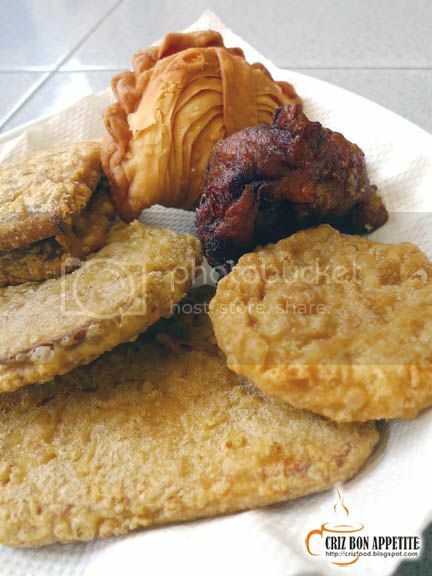 One of the known ones would be the Sweet Glutinous Rice Fritter (Thnee Koay) where a slice of the sweet delicacy would be clamped between a slice of sweet potato and a slice of yam, prior to be dipped into a tempura like batter and deep fried to perfection. This is one great snack that no one would want to miss out. Another one great snack would be the savory type of Curry Potato Puff. If you are lucky, you might even find some stalls selling those filled with additional chicken, beef, mutton or even peanuts. The Mashed Banana Fritter is something I love a lot too. There’s actually no secret recipe for this snack as it only contains mashed ripen banana with frying flour. The end product can be real delicious. 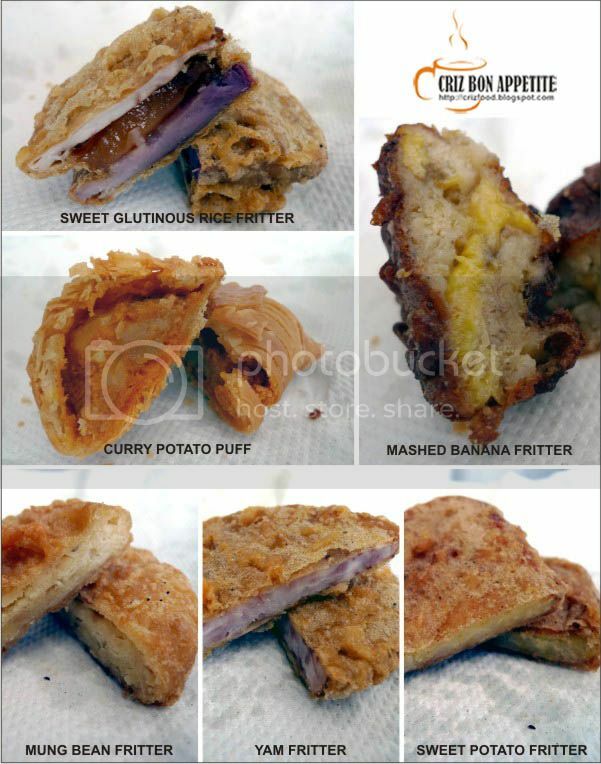 There are also many other nice fritters available such as the Mung Bean Fritter, Yam Fritter, Sweet Potatoes Fritter, Whole Banana Fritter, Tapioca Fritter, Cempedak Fritter, Breadfruit Fritter and many more. Do you know why I love those snacks so much? It’s because they are simple yet less messy for me to consume while doing practically anything online such as FaceBooking, playing online games, watching online movies, or even busy chatting away through MSN or Skype. How nice it has always been to savor those nice snacks with a cup of my favorite green tea. 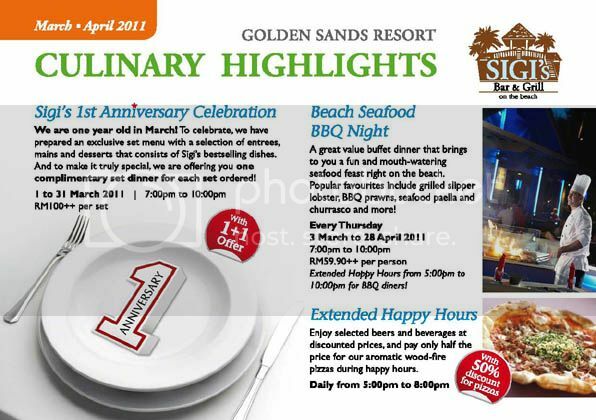 In conjunction with its First Anniversary, Sigi's Bar & Grill on the Beach, Golden Sands Resort, is promoting its special First Anniversary Set Meal at RM100++. This promotion comes with a "1+1" offer, where you can bring along your partner to enjoy the breezy evening by the beach while getting yourself pampered with the great food served here. Pizzas are at 50% off for a limited time. Make yourself available between 7.00pm and 10.00pm nightly (except Thursday and Sunday) to indulge in the fine creations of Executive Sous Chef, Mr John Brock. This promotion is available until 31 March 2011. Check this review here. You also should not miss out the Thursday's Beach Seafood BBQ Night. Some of the main attractions include Grilled Slipper Lobster with Tarragon Butter, Valencian Seafood Paella, Moroccan Fish Tagine with Cous Cous, Butterfish with Chimichurri Rub and many more. 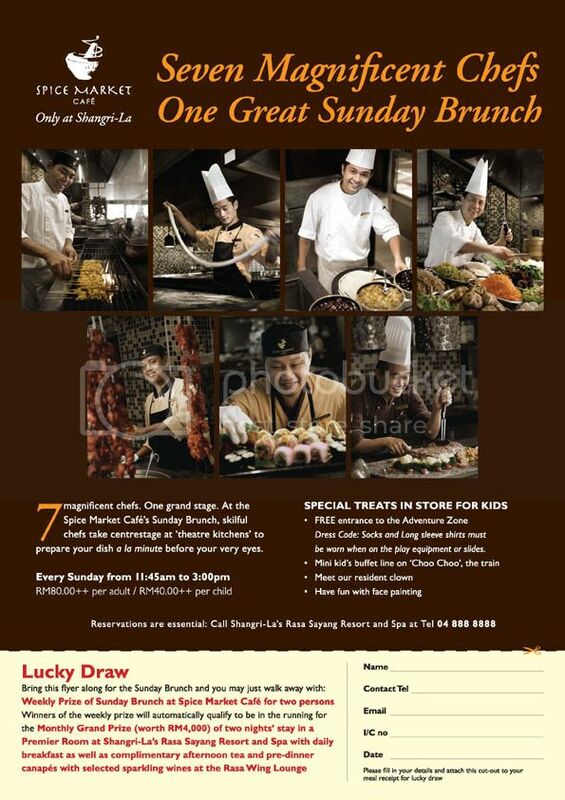 This promotion is available until 28 April 2011 at RM59.90++ per pax. Check this review here. If you feel that you would rather bring your family for a weekend of relaxation, there's always the Sunday International Buffet Lunch at the Garden Cafe, Golden Sands Resort. Priced at RM59.90++ (adult) and RM19.90++ (child), you would be able to indulge in international spread of dishes specially created for you and your family members. The promotion is available until 17 April 2011, with the "1+1" offer as well. 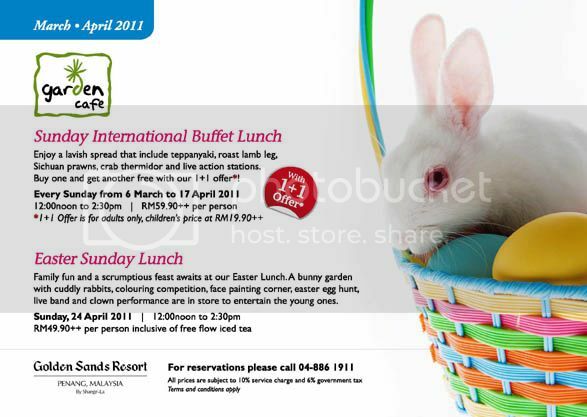 Do take note that there will be an Easter Sunday Lunch (RM49.90/pax) at the Garden Cafe on 24 April 2011. There will be lots of entertainment and fun for your whole family. Have you tried out the Spice Market Cafe at Rasa Sayang Resort & Spa? Do check out their Sunday Brunch where you get to test out the skills of 7 magnificent chef under one roof. Priced at RM80++ (adult) and RM40++ (child), you might also walk away with their Weekly Prize for 2 persons and/or the Grand Prize worth RM4,000. HAVE YOU TAKEN YOUR NOODLES TODAY? 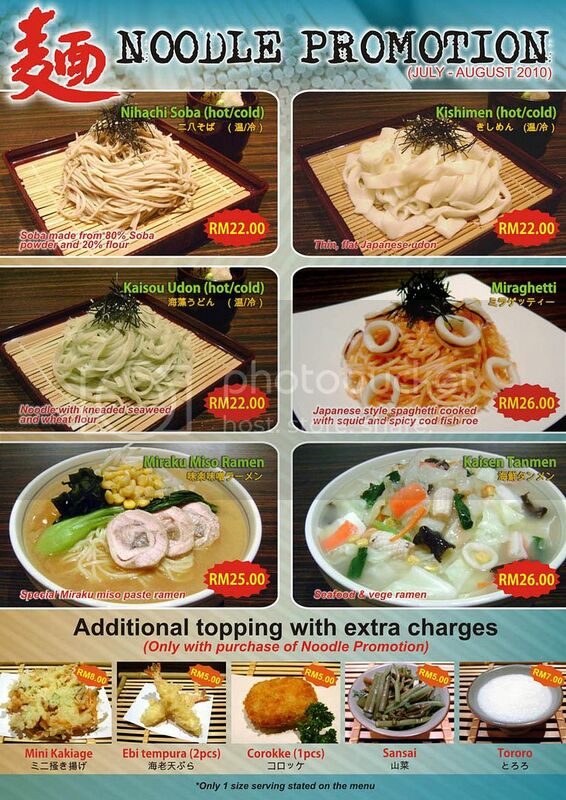 Thrill yourself with a wide selection of Japanese noodles at Miraku Japanese Restaurant this July/August 2010. You can opt for a rich bowl of hot noodles or cold noodles. Call 604-229 8702 to make your booking now as it can be real packed during dining hours. WHERE TO BREAK FAST DURING THIS RAMADHAN? 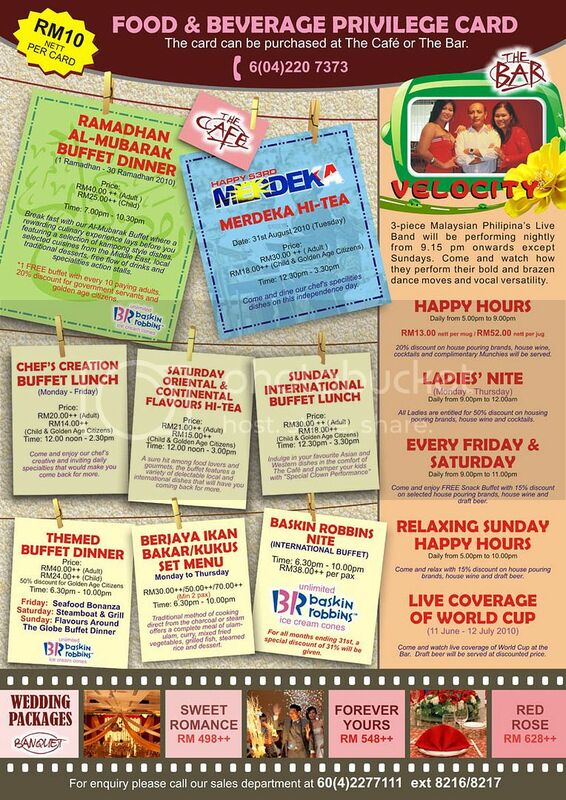 If you would like to dine in a great atmosphere during the month of Ramadhan, why not head down to The Cafe, Berjaya Hotel Penang for that experience? There would be a wide spread of dishes available just like how your Mum would cook them. I did mention in my earlier post on the promotion Miraku Japanese Restaurant was having for their 4th Anniversary. I was truly impressed. The Miraku Special Bento set was a blast at only RM33++. Even my Dad had a hard time trying to finish off the generous amount of food given. 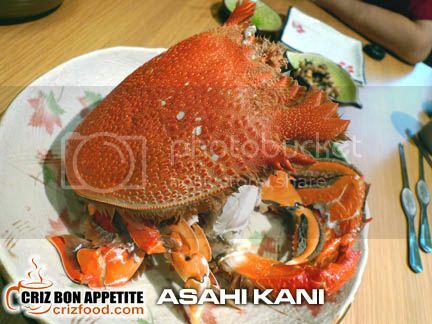 What impressed me most was the almost 1kg weight giant crab - the Asahi Kani. It was lovely and my Mum had an enjoyable time digging into the meaty crab. The good news is, the price for the crab had decreased to only RM30++ per crab until the end of June 2010 or until stocks last. Don't miss out this hard to come by golden opportunity to try it out. Just head down to Miraku Japanese Restaurant at G Hotel, Penang right now! You might want to call in 604-229 8702 to make your reservation.